We don’t print on readymade garments, but here’s the trick. What we do is we print fabrics with an image applied onto a pattern digitally and then printed on a roll of fabric. This is a great method of printing as its reassures consistency in quality and correct placement of an image on to a garment, from garment to garment every time you print. This process of printing has been adopted by many fashion and swimwear companies who are looking for consistency and a particular image placement on their garments. 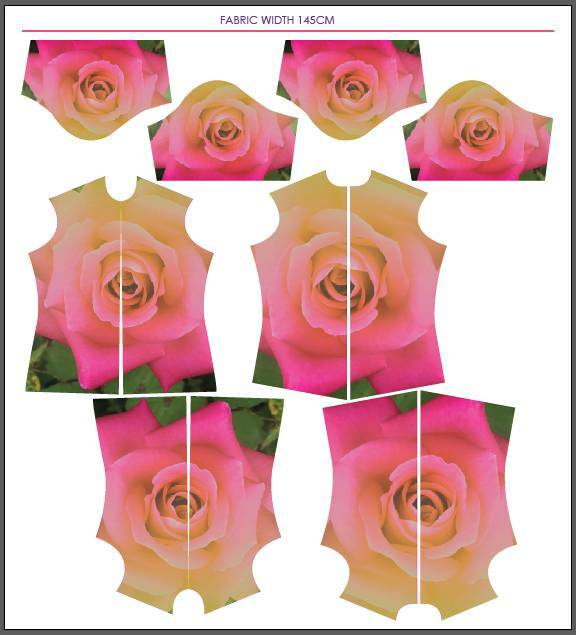 This example below shows how a pattern with an image applied will be printed and then cut along the pattern lines for further production.